NASA scientists estimate that there are currently over 500,000 particles of marble-sized or larger debris, and almost twice that amount of microscopic pieces of man-made trash, floating in Earth's orbit. The polluting culprits range from small rocket pieces to large satellites and fuel tanks. What's worse is that the larger objects often cluster in similar orbits and crash into each other, creating tiny, hard-to-collect rubble. Researchers worry that the ever-thickening layer of waste could potentially interfere with our communication tools by either blocking satellite reception, or, worse, causing damage to the satellites. If left unchecked, it may someday even prevent spacecraft or satellites from passing through. “So basically, we’re trapped,” Roosegaarde says. "For me, space waste is such an obscene beauty — it’s incredibly intriguing, but it’s also incredibly sad." To tackle the issue before it gets out of hand, Roosegaarde is collaborating with experts from the European Space Agency (ESA). The designer intends to achieve his goal by educating the public about the urgency of the situation and coming up with feasible solutions to solve the problem. 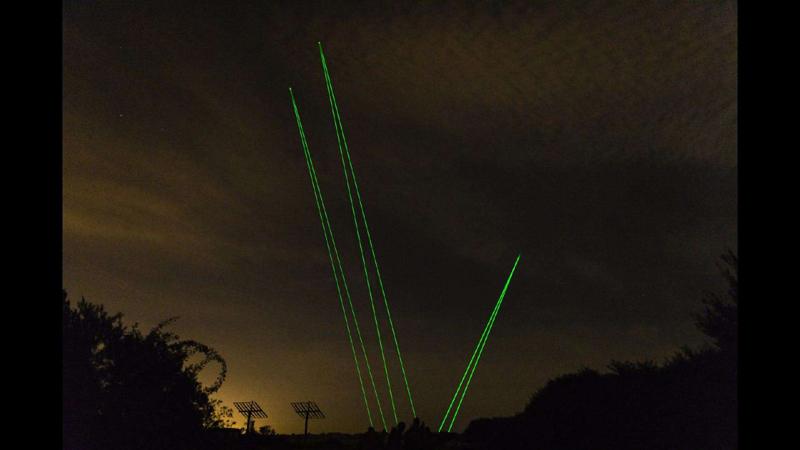 The initiative, called the Space Waste Lab, launched in October 2018 with a spectacular laser show in the Netherlands. The unique outdoor artwork of LEDs staged on select days in December 2018 and January 2019, used real-time tracking information to point at pieces of space junk floating at altitudes of 200 to 20,000 kilometers (125 to 12,500 miles). The enthralling experience, enhanced by shutting down street lights and commercial signs, was designed to raise public awareness of the amount of space junk. 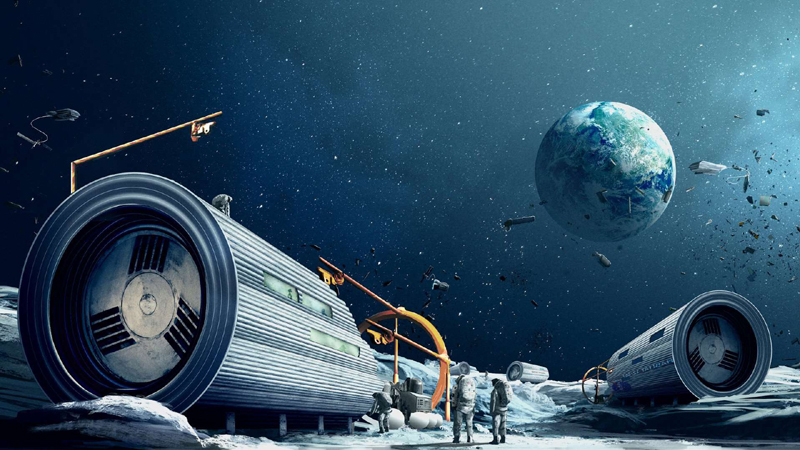 Space Waste Lab also plans to spread the message by staging temporary exhibitions in various European cities. Visitors will be educated of the issue through films, presentations, and an expo program entitled "Space @ KAF," which covers a wider context of space. The artist says, "We need to look at space in a better way. What is space waste, how can we fix it, and what is its potential? Space waste is the smog of our universe." To find a solution to the issue, the designer has been brainstorming with experts. One of the projects being considered is “Shooting Stars,” which attempts to reintroduce the trash to the atmosphere in a controlled way. 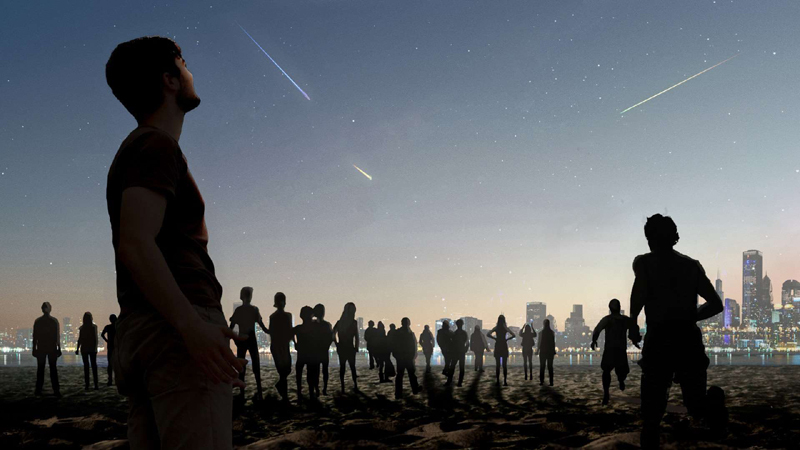 Upon reentry, the waste would burn in the atmosphere like a shooting star, creating both a “spectacle" and "an immersive awareness event.” Roosegaarde envisions that if successful, burning space trash could someday replace fireworks at large public events! He is also contemplating an effective way to harness the floating debris and use it as material to 3D print structures for the moon. Roosegaarde isn’t the only one trying to solve this elusive problem. In September 2018, the RemoveDEBRIS satellite, launched to test some of the previously proposed ideas, successfully deployed a net to capture a target CubeSat while orbiting at an altitude of about 300 kilometers (190 miles). Sometime this year, the capsule, developed by UK-based Surrey Satellite Technology, will unleash a harpoon that has been designed to de-orbit space trash. At the end of its mission, RemoveDEBRIS will release a sail to bring the satellite, and, hopefully some trash, back into the atmosphere, where it will burn up on impact. The outcomes will determine if any of the techniques are good enough to undertake the gargantuan task of cleaning up our skies.